It didn't take long for Black Ops players to kill the entire population of this blue planet in-game. 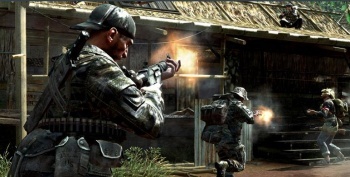 Lots of people die in matches of Call of Duty: Black Ops. Something like a simple round of team deathmatch takes a good 75 kills to win - and when you consider that there are millions and millions of people playing team deathmatch every day, those numbers add up. Those numbers really add up: According to the statistics that flash on the bottom of the screen between rounds, gamers have slaughtered 150% of the world's population in the three weeks between now and CoDBlops' launch earlier this month. It only took two weeks to hit the 100% mark, reports Virtual Economics. Players have also fired roughly 200 billion bullets in that time, which really doesn't say much about our accuracy rate in-game. Black Ops became the biggest entertainment launch in history earlier this month. Feel free to - like Jeffrey MacCormack - find your own poignancy in the idea that such a popular piece of entertainment allows us to drive ourselves extinct one-and-a-half times over.